This entertaining bilingual book for intermediate readers features a fourth-grade bully avenger. During the school day, Lance García looks like a typical fourth-grader at Oakland Elementary School. But after school, dressed in disguise—black jacket, black baseball cap and dark, cool sunglasses with tiny, rectangular mirrors so he can see who’s behind him—he checks the mailbox labeled “Malo Mail.” No one realizes that he is the infamous Mister Malo, righter of wrongs, punisher of bullies. There’s an interesting plea for help in the mailbox. Isabella Santos spread a rumor that Madeline Wilson farted on the playground, and now everyone makes farting noises when she walks by. No one will talk to her, and a group of boys in particular are making her life miserable. Madeline offers Mister Malo a large box of tropical-flavored fruit snacks if he’ll teach Isabella a lesson. Soon Lance is busy plotting the perfect revenge. He wants to rehabilitate the bullies and help them realize how hurtful their actions are. What will be the best tactic to convince Isabella that being laughed at and picked on is no fun? 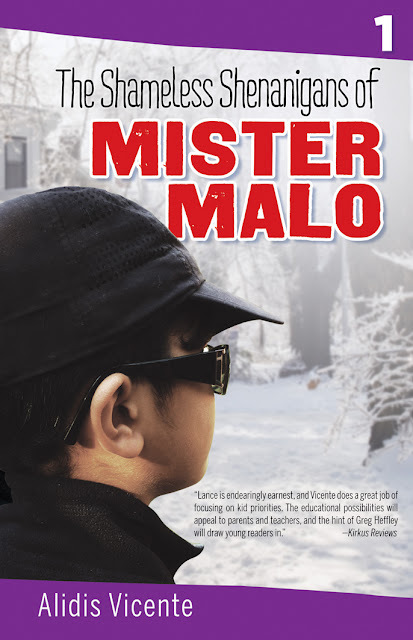 But Mister Malo’s scheme doesn’t go exactly as planned, forcing him to think outside of the box. Meanwhile, Lance has to deal with his own problem in the form of his difficult cousin, Manuel. This entertaining bilingual “flip” book will resonate with kids ages 8-12 in its examination of popularity on the school grounds and dealing with troublemakers. ALIDIS VICENTE is the author of two bilingual books for intermediate readers in The Flaca Files / Los expedientes de Flaca series, The Case of the Three Kings / El caso de los Reyes Magos and The Missing Chancleta and Other Top Secret Cases / La chancleta perdida y otros casos secretos, and two picture books, The Coquí and the Iguana (Operation Outreach-USA Press, 2011) and Violet (Operation Outreach-USA Press, 2014). She received her bachelor’s degree from Rutgers University and worked for New Jersey’s Division of Youth and Family Services. She lives with her family in New Jersey.